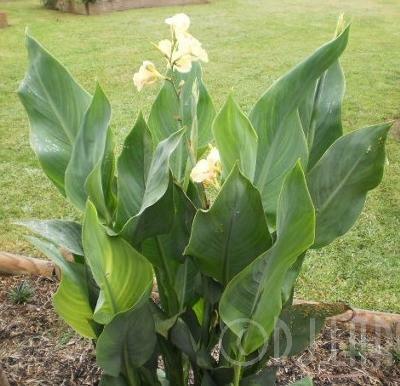 After recovering from my avoidence of planting yellow flowers & now loving the variety in the yellows of many canna blooms, as I've previously mentioned, what a surprise this one was that I grew from seed purchased from Thailand! I wasn't particularly after another yellow one. The photo of the seed parent flower was gorgeous & I fell in love with it .. extremely different to what grew from the seeds! But then, growing from seed there is always a chance of genetic variation .. it'd be a boring garden experience if it wasn't for the 'birds & bees'! AND the ants, moths, butterflies, other bugs, little & not so little birds! 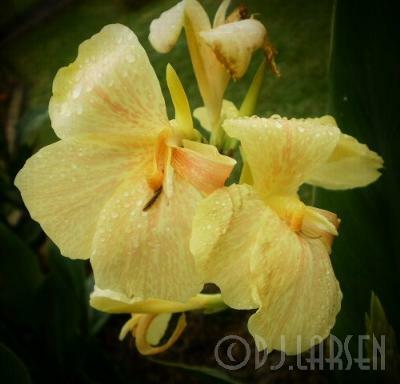 Canna flowers certainly attract a lot of 'life' in my gardens! Anyway, back to the result from the seeds .. I planted them just over 2 yrs ago, with a germination rate of 90%, so I had quite a few to watch & see if they were the same or variable in flower, height, rhisome habit, leaf growth etc etc. Within 6mths of germination (in a hothouse during Winter), after planting out the seedlings at 12weeks growth, they flowered! I staggered the plantings to see if they all did the same & they have. they went & have a slight pendulous tip at the end. The leaf is blue/green with distinctive ribbing (which looks like white lines when sun shines thru them) from the middle towards the leaf edges, which have a thin white lined edge. The rhisomes are white, long & thin & grow 'twisted' & 'undulated' rather than straight outwards! They look somewhat like a 'big dipper ride'! Sections that arch up out of the ground, show green coloration. The flowers start out a deep lemon as buds. 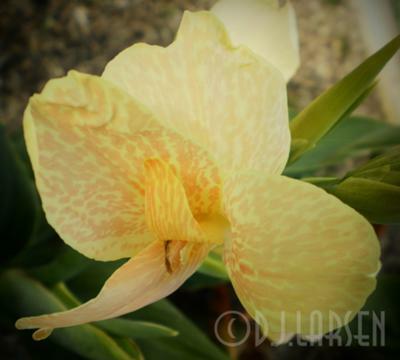 As they open, the colour is a lovely soft lemon background with salmon spots, blotches & streaks. The lemon will fade to pale lemon as the blooms age, but the salmon still remains salmon but faded. The oldest blooms fade no lighter than palest lemon, not white. You can see the flower style by the photos. I'll have to read more of Raelene's 'Canna Parts' & do this bit of info better! Overall height is stablising at 153cm (5ft) from ground to flower tops. Rhisome divisions are growing identical to the 'parent' clumps. I have had only one 'variation' from the seeds (1%) .. all is the same except the bloom is smaller, the salmon spots/streaks are large splotches & darker, while the lemon background is also darker. Well, hope this didn't bore you too much! Join in and write your own page! It's easy to do. How? 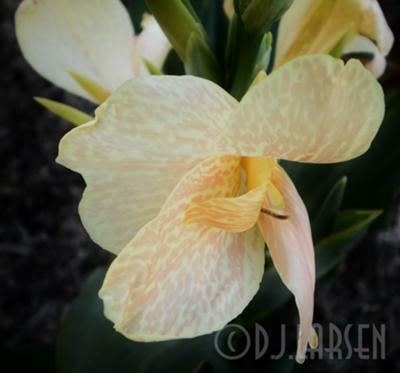 Simply click here to return to Yellow Garden Cannas.